Passion is the only way to build a successful business and brand, best-selling author and TV presenter Liz Earle MBE has told an audience of business leaders in Belfast. She was delivering the keynote address to more than 400 delegates at the annual Institute of Directors Northern Ireland (IoD NI) Women’s Leadership Conference. Held at Crowne Plaza Belfast, the event, sponsored by leading law firm Arthur Cox, focused on the themes of leadership and innovation. Those in attendance also heard from Flybe CEO Christine Ourmieres-Widender while a series of panel sessions took the themes of innovation, emotional intelligence and how to stand out as a trailblazer in traditionally male-dominated industries. “The only way to have a successful brand is to be absolutely passionate about what you do. You have to live it, feel it, and believe in it. “If you have passion there is no ‘off switch’. You have to lead from the front and encourage people to come with you. The conference also provided a platform for five aspiring entrepreneurs to pitch to the audience to win a £4,000 cash injection for their fledgling firm. Becca Hume was voted the winner, and will put the funds towards their business TapSOS, an app which allows users to contact emergency services at the touch of a button. “Congratulations go to Becca, whose winning pitch showcased a sound business plan and illustrated innovative thinking and a strong understanding of her target marketplace. “She is part of a strong network of female entrepreneurs in Northern Ireland, that make a real difference to economic standards locally as they seek to create new wealth and increase business output in the local economy. “As an organisation, we work to support that network and provide the assistance to help current and future business leaders succeed. “Each year, the IoD Women’s Leadership Conference provides a valuable insight into the leadership techniques and best practice of some of our most prominent and successful businesswomen. 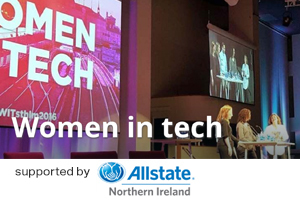 “The organisation is to be commended for assembling what could only be described as a stellar line-up of speakers from Northern Ireland and beyond, representing a diverse range of experiences and sectors. For further details on the IoD including a calendar of upcoming events, visit www.iod.com/ni. An article that is attributed to Sync NI Team has either involved multiple authors, written by a contributor or the main body of content is from a press release.